Sydney, Australia — March 13, 2015 — Esker, a worldwide leader in document process automation solutions and pioneer in cloud computing, today announced the launch of its new collaborative and customisable solution dashboards. Designed for both managers and employees alike, the dashboards enable users to facilitate daily tasks, monitor performance and react quickly to identify bottlenecks or spot opportunities early, making every action smarter and more strategic. 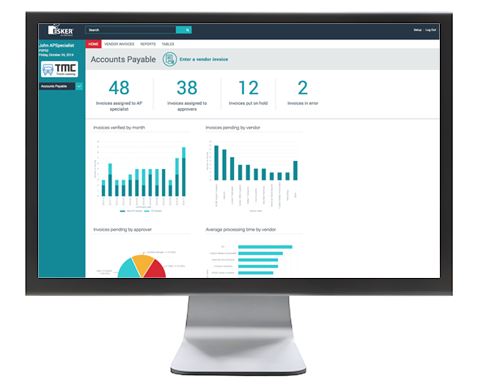 The new dashboards, which are integrated into all Esker solutions, enable users to access the right information when they need it, monitor key performance indicators (KPIs) and provide real-time visibility on work in progress. Information can be easily shared and analysed in order to identify areas for improvement and better allocate resources and manage workload. Solution administrators can custom-design dashboards to best meet the needs of their users, as well as define metrics that align with business goals. Users, depending on their profile, can add or remove KPIs and metrics at their convenience. They can even customise metrics such as priority levels, refresh rates, names and more. Over a dozen metrics are available for each business process. For example, users of Esker’s Sales Order Processing automation solution are able to view the number of new orders to validate, urgent orders, orders in dispute, and those on hold. Increased responsiveness to issues and opportunities: anticipation and identification of bottlenecks, reallocation of workload, monitoring of KPIs, etc. Dashboards have been available since early 2015 for all Esker solutions and in all countries. In edit mode, a simple drag and drop is enough to change how metrics and graphs are displayed. The setting for each metric and the priority level are also visible with different colours. “Esker dashboards allow business process managers to monitor in real time the ‘fitness’ of their processes and their teams. Just like reviewing your daily fitness activities by uploading your health band data to your favourite heath application, Esker provides new tools to assist its customers improve their ‘process fitness’ in real time,” says Christophe DuMonet, Managing Director of Esker Australia and endurance cycling amateur (real time cycling data provided by Garmin and Strava app). Learn more about Esker’s dashboards.